Artistic Illustration of the TRAPPIST-1 system. Source NASA. On February 22nd, 2017, through a press release, NASA reveals a historic discovery concerning the existence of new exoplanetary system, called TRAPPIST-1, which hosts seven planets, comparable in size and mass with Earth; three of them being located in the habitable zone, the most likely to have liquid water. The super-cool dwarf star, located at about 40 light years away from Earth, is being named after the TRAPPIST mission – Transiting Planets and Planetesimals Small Telescopes. ”One light year means about nine trillion kilometers, i.e at one milliard add three more zeroes. At the moment we cannot perceive yet to cover such a distance with human capabilities. Perhaps, it is necessary a paradigm shift, a change of perception, which will allow us, hopefully in a near future, to see how we could access these stars”, says President of the Romanian Space Agency (ROSA), Dr. Marius-Ioan Piso, in an interview accorded at Radio France International (RFI). The observations began at the end of 2015, when a team of astronomers from University of Liege, Belgium, decoded the data acquired with the Liege telescope TRAPPIST-Sud, located in Chile. Further ongoing observations have implied more telescopes on-ground (TRAPPIST-Nord in Morocco, UK Infrared Telescope – UKIRT in Hawaii, William Herschel and Liverpool telescopes in La Palma, and the South African Astronomical Observatory telescope) and the NASA’s Spitzer space telescope. “In order to detail the atmospheric composition, or the structure of the rock of those planets, we may need perhaps a decade from now on”, says scientific researcher at the Institute of Space Science (ISS), Dr. Gina Isar, in an interview accorded at Antena 1 Observator TV. 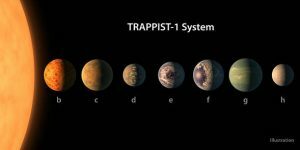 However, NASA has made the reveal that seven planets revolve around TRAPPIST-1, through long and dedicated observations of better precision with the Spitzer space telescope. The remarkable results were recently published in Nature, which conclude that: “The TRAPPIST-1 system represents a unique opportunity to thoroughly characterize temperature Earth-like planets that are orbiting a much cooler and smaller star than the Sun” [Gillon, M. et al. Nature, 2017]. The TRAPPIST telescopes are part of a wider project called SPECULOOS – Search for habitable Planets EClipsing Ultra-cOOl Stars, which aims to detect more systems of this type, with four new telescopes in Chile. Further observations will continue with new performant telescopes, both on ground and in space. More information on the TRAPPIST telescopes can be found here. More information on the SPECULOOS project can be found here.